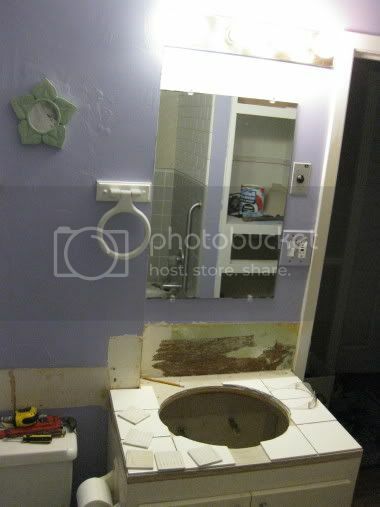 Remember how much fun we had remodeling the back bathroom? Well, it was such a hoot that now we're doing the front one. And by "we" I don't mean "me" because I haven't done any work on this one, other than making a quick trip to pick up more tile. Fortunately, we didn't have to rip everything down to the studs and replumb everything. All that's really changing is we're adding a shower head (it had a tub only) and switching out the sink and light fixture. But to do that we had to rip out the cabinets to get to the plumbing, so now I'm getting a new drawer and fresh paint on the cabinet drawers. When we first moved in, the bathroom was horrible. It had the original floor tile, which I love, but everything else was pretty disasterous. The cabinet doors were dark fake wood veneer and hung crooked. The walls were a thin coat of ugly paint over striped wallpaper. The sink was at one time white marble that had yellowed over the years. The backsplash was just a piece of marble leaning against the wall unattached. There was a marble shelf at counter height that extended over the toilet, making it nearly impossible to get to the tank if something needed fixing. The light fixture was gold, but all the hardware was chrome. I did what I could with paint and new cabinet doors and hardware, but left the rest alone. Eight years of scrubbing the sink with Bon Ami took out most of the yellow tinge, but the backsplash and the shelf never really got any better. 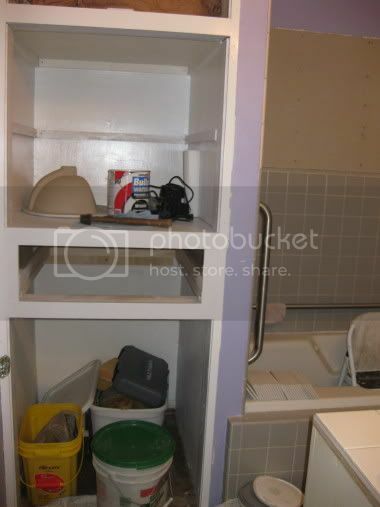 Eventually, it was the lack of a shower head that lauched the remodel. Now that the kids are bigger, they don't want to take baths any more, and only having one shower was becoming a pain. But I just couldn't face another full remod, so we're doing it on the cheap and quick. My BIL replumbed to add a shower head, and we're adding new tile above where the existing tile stopped to protect the wall. I figure it will be behind a shower curtain most of the time anyway. We're replacing the old solid surface marble sink by retopping the existing vanity with tile and putting in a drop-in. I may splurge on a custom-cut mirror since the current one is tiny and off center due to the light switch being in the way. And I'll paint. I love the periwinkle but back when I painted, it was a bathroom for two little girls and now I have a teen girl and a boy. I'll probably spend the next year trying to find a shower curtain I like. Anyway, I forgot to take before pictures, so here are a couple of in progress pictures. I'm thinking while I'm at it, I should change out the towel ring. What say you? LOL - I have always hated it (believe it or not, it was even uglier before we painted it) but I have a weird habit of getting attached to things, even things I hate. But I think it's definitely time for it to go. I can't wait to see some more progress and, of course, the final result. And, don't worry, my parents have had three brand new toilets sitting in their living room for two months now. I hope my mom incorporates them into the Christmas decor somehow.